Import the data from your instrument. This is usually an easy step if appropriate import filters for your instruments are already available. (1) Clicking the command "File>Import" opens the list of available filters and allows you to select your instrument from the list. As each instrument has its peculiarities, the description of the detailed steps to import data should be taken from the description of the corresponding import modules. Loading an existing data file. If you previously saved your data as an ImageLab file, you can reopen it by clicking the "File Open" button or by selecting a file from the list of recently used files . Simple data analysis. At this point you can already get a first impression of your data by creating images from the raw data and performing some preprocessing steps (e.g. removing bad pixels, detecting background pixels, smoothing the data, etc.). However for further analysis you have to work with spectral descriptors. Define a set of spectral descriptors. This is the most important step when preparing a (multivariate) analysis of your data, since ImageLab consistently uses spectral descriptors instead of raw data throughout the process. The rationale behind the idea of spectral descriptors can be found in the section Background Information on Spectral Descriptors. 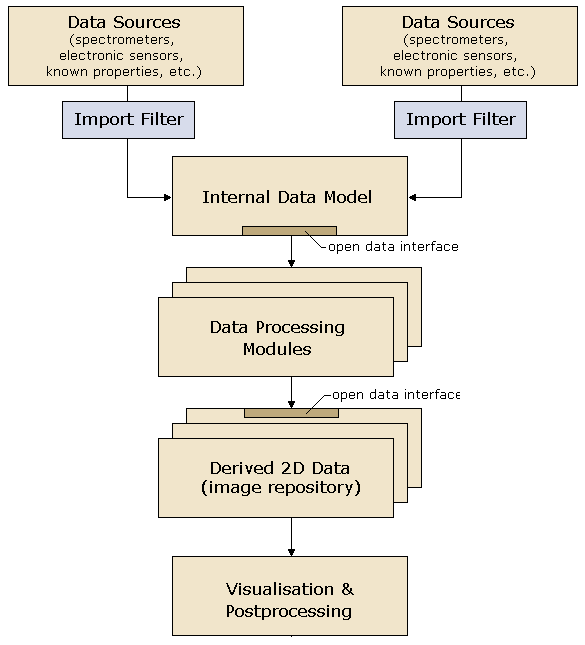 ImageLab provides several sets of predefined spectral descriptors which are named "ilab_XXXX.spdc", with "XXXX" indicating the particular spectroscopic method the descriptors have been defined for. Analyze your data using the built-in multivariate techniques. After selecting an appropriate set of descriptors you apply multivariate statistical methods for further analysis. Copy interesting images to the image stack. All images (created from raw data plots or from elaborate statistical methods) can be transferred to the image stack which allows the user to superimpose up to eight images on top of each other and even to blend the results with a high resolution photo used as a background image (see the section Adding Photos to the HSI Dataset for instructions how add a background image). Copying an image to the image stack can be done by either clicking the "add to image stack" button , or by selecting the command "Copy to Image Stack" from the context menu of an image (right-click the image to open the context menu). (1) If your instrument is not on the list, please contact the ImageLab development team: office@epina.at. Currently we are offering implementations of import filters for additional instruments for free. However, please be prepared that the process of creating an import filter will also require a modest effort on your side as well (by providing example data and giving feedback during the development loop). Import filters can usually be developed within a few days.